It’s been a while coming – we first reported this back in 2012 and again in 2013 – but West Hampstead now has free WiFi, having miraculously shot to the front of Camden’s queue. We were originally slated to be in “phase 3”, but we join parts of Bloomsbury, Holborn, and Kilburn in being first in line. Clearly the council recognises that we all need to tweet all the time! WHL didn’t spend too long in the murky drizzle of dusk testing the full reach of the new service, but the connection was very weak by West End Green and much stronger by the first 139 bus stop heading south. The WiFi infrastructure, powered by Arqiva, is apparently attached to lampposts, though it’s not immediately obvious where and we didn’t see any “Access point” signs, but nor did we hunt high and low for them. 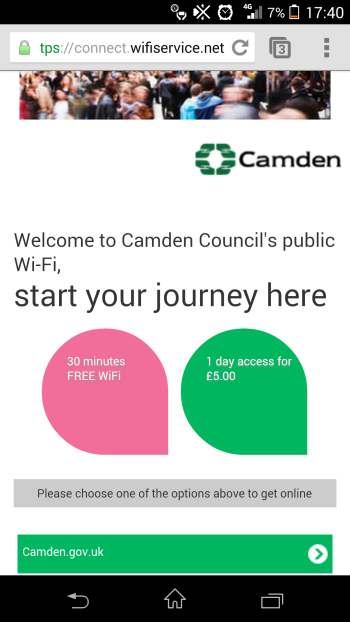 My phone picked up the “_Camden_WiFi” network, which gives 30 minutes free access before you have to shell out £5 for the rest of the day or £30 for the month. It’s hard to imagine that many people will pay for this in West Hampstead with most cafés offering some sort of free WiFi service already (Camden’s network appeared well down my list of options), but it’s good to have and if does stretch to West End Green then it might encourage people to sit outside and tap away on their tablets. Of course the rise of 4G networks also means that short burst uses of WiFi for phones is less necessary, but 4G coverage isn’t that reliable yet. “The completion of this first stage marks a major step in enhancing the borough’s digital services and making Camden the best connected place in the country. By rolling-out a free Wi-Fi network, we’ll be able to ensure residents, businesses and visitors have access to the best mobile network experience available while at the same time addressing network congestion and coverage issues.